ONE lonely bicycle! Just because the streets were wet, there was a light rain mist, the sky was darkening, more rain was imminent, and a facebook post indicated that the ride was unlikely, apparently people decided to use that as an excuse. Well, delicate riders, you have another chance! 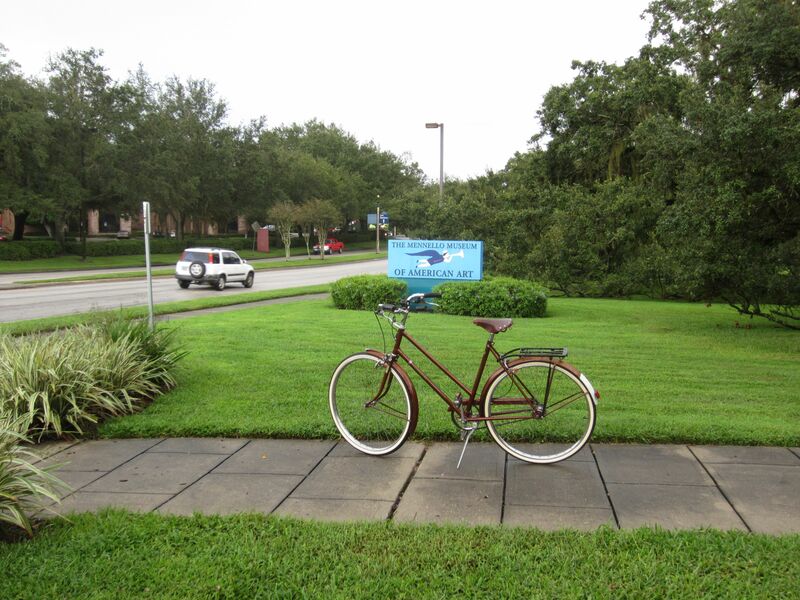 We are having a do-over “First Friday Ride” this Friday, October 12th. The weather should be lovely, and there will be some fun and interesting bicycles and people. You know you need a nice ride to kick off the weekend! We’ll meet at 6 PM in front of the Mennello Museum of Art on the south side of Loch Haven Park. A prize will be awarded for the person who makes the greatest effort/sacrifice to be there. So be ready to make your case. We don’t want another sad scene like this, of a British bicycle that waited for 38 years to ride with Commute Orlando, even in the rain, only to leave wet and disappointed. Don’t they still sell helmet covers, rain jackets and overtrousers? This is Central Florida, Ian. Still hot and humid, and even with the best breathable rain gear, you will stew in your own juices. Trust me, I know from experience. Here, being rained on feels good, except for a few cooler months a year. Temperature on the 5th when I left home to go to the ride was 89F with 94% humidity. Rain on me! That’s the dirty secret of ‘breathable’ raingear. It ‘can’ breathe, but it won’t if there’s a warm human exercising inside it. It’s why I pack a bike poncho. No getting wet and no getting icky. But hey, if rain is so nice in Florida, why don’t people show up in their swimming gear? Neither bikes nor humans melt. Wimps! Lightning. There was an abundance of it a little while earlier… when many people were at the decision point of whether or not to travel to the ride start. Keri is absolutely right. 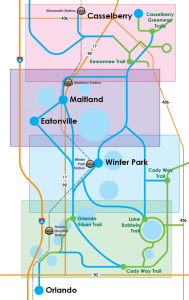 Orlando is right on “Lightning Alley” which runs from Tampa to Titusville. Lightning Capital of the USA. We have an average of 100 days a year with lightning storms here in Central Florida. 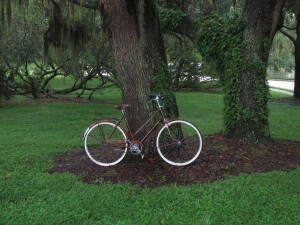 Spokes People — Bike-umentary Orlando Makes the Top 100! Again!